It's possibly the first crowd-sourced criminal investigation in history leading to federal indictments. 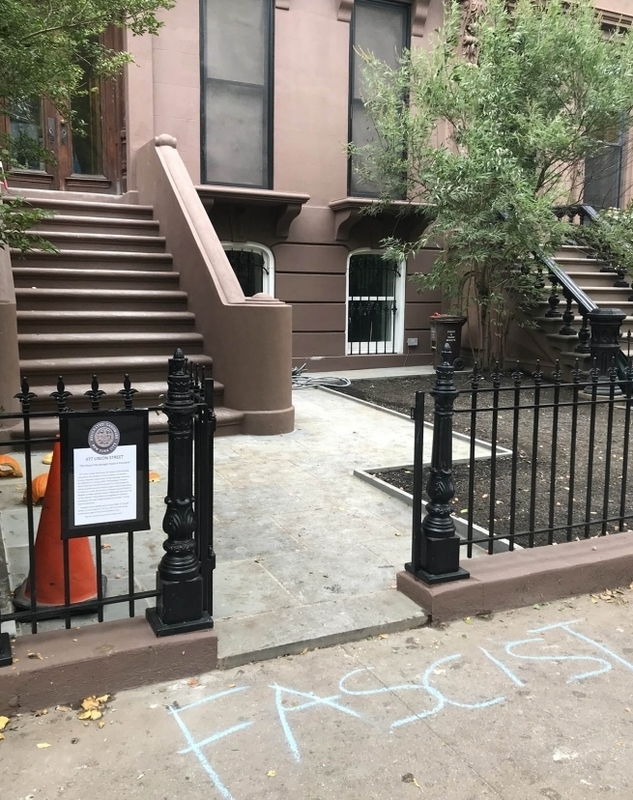 Last February, Time/Life war correspondent, Ed Barnes, texted me about a neighborhood blog in Carroll Gardens, Brooklyn, called Pardon Me For Asking, run by a blogger, Katia Kelly. Katia's blog isn't much different than mine, with the exception that she updates hers a helluva lot more frequently than I do mine. For quite some time Ed had been working the international angles on Paul Manafort, Donald Trump's ex-campaign manager. He focused on Manafort's involvement in the corrupt Ukrainian presidential campaign of big-time embezzler, Viktor Yanukovych, which resulted in corruption charges against Manafort in the Ukraine. Ed asked me to do some tech research for him, including trips into the Dark Web to retrieve information I definitely didn't want on my computer. I remember Ed's comment when he sent me Katia's blog link, "She got him!" Katia reported an eyesore property in her neighborhood with a NYC Dept of Buildings Stop Work order on the front door. She did some research and found that it was purchased by Paul Manafort. She dove into public records at the NYC City Register's Office and learned that it was purchased for $3 million but, curiously, had $12 million in mortgages on it, split between two banks. There were other suspicious records associated to it too. Banks don't normally write mortgages for 4x the value of the property so this story attracted a real estate attorney from the neighborhood who was a casual visitor to Katia's blog. He contacted a friend in Bay Ridge who was also an attorney. 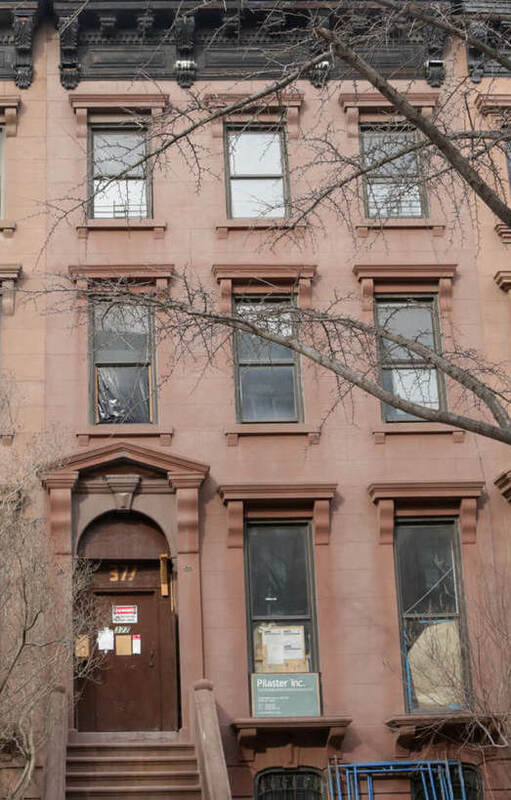 Together, they created their own blog, 377 Union, (the address of Manafort's Brooklyn building) to focus on these curious transactions as well as other strange Manafort dealings. Nine months later, Paul Manafort and his deputy are facing federal charges adding up to scores of years in prison, millions of dollars in fines and the Trump White House in full damage-control mode. Katia is just a Brooklyn woman who normally writes about restaurant openings and other such local interest happenings in her quiet, gentrified neighborhood. But she became one of the snowballs that started the biggest investigative media avalanche since Watergate, proving the value of an alert citizen with a blog. It's nice seeing Katia getting some recognition. The Daily Beast did an article on her and her cyber-partners today. If Pulitzer had a category for Citizen Journalist, Katia would surely win it. 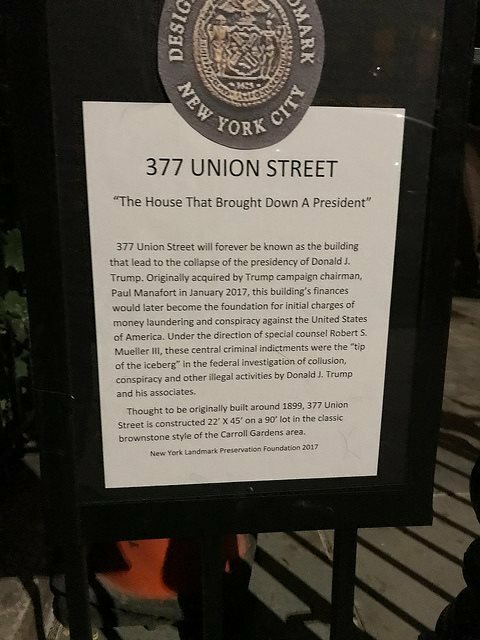 For a litle comic relief, an artist friend of mine Halloween-pranked Manafort's house with a phony NYC Landmarks plaque, which got picked up by papers all over the world. Seemed like an appropriate #FakeNews piece for this administration.